NCSCA was initially proposed at the Carolina Friends School Climate Conference and Environmental Club Social that took place in March of 2013. Since then we have created a Facebook page to keep in contact about climate and environmental events in North Carolina. 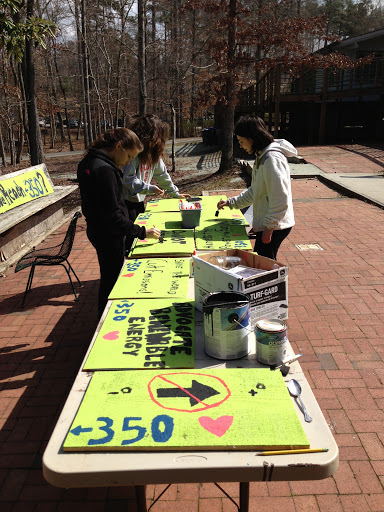 NCSCA also endorsed the 2013 iMatter March for Our Planet in Raleigh NC. We have many more events in the works, and hope to start the 2013-2014 school year strong. If you would like to help us, please contact us. North Carolina Students for Climate Action is a coalition of students working together to create positive climate action in our communities, state, and world. As members of the next generation, we are troubled by the damage that a radically changing climate will cause to human life, the environment, and our future. We aim to raise awareness in our communities and across the state about the causes and effects of climate change, and to take action through politics and community organization. In our activism and projects, we seek to involve a diverse range of students, regardless of political or social affiliation. We will no longer be idle; climate change is here and now, and it is our responsibility to better the world of tomorrow.